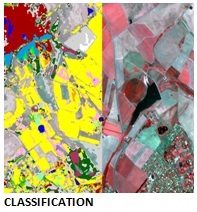 The GEO Data Design processing services are designed to create a value added product to supplement all imagery acquisitions. 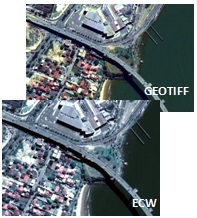 This is a process of merging high-resolution panchromatic and lower resolution multispectral imagery to create a single high-resolution colour image from three, four or more low-resolution multispectral satellite bands plus a corresponding high-resolution panchromatic band. Radiometric resolution specifies how well the differences in brightness in an image can be perceived; this is measured through the number of the grey value levels. The maximum number of values is defined by the number of bits (binary numbers). Re-scaling allows an image to be converted, for example from a 16-bit to an 8-bit image, depending on the requirements of the software the image is being viewed in. Standard bits per pixel: 16-bit unsigned. To change the projection (or coordinate system) of the imagery to another projection type. Standard projection: UTM WGS84. This orthorectified product is terrain corrected by Geo Data Design technical personnel using the SRTM DEM and an automated workflow in ERDAS IMAGINE software. 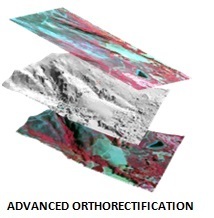 The orthorectification process enables us to quickly deliver accurate terrain corrected multispectral satellite imagery which can be used for mosaicking, base mapping and change detection. 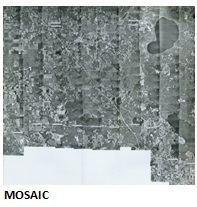 Mosaicking provides the capability to stitch images together to output one large cohesive image. 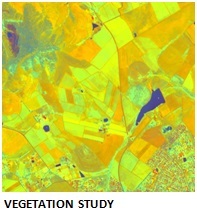 The satellite imagery which is orthorectified in ERDAS IMAGINE will be mosaicked to provide uniformly similar imagery. The mosaicking will be performed using the Mosaic Pro tool from the image processing software, ERDAS IMAGINE. During the mosaicking process colour balancing will be applied to create visually appealing imagery by enhancing the pixel values. 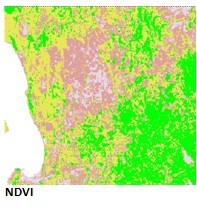 Unsupervised and Supervised classifications – 10m output pixel size. General classification containing classes such as but not limited to: vegetation: grass, shrub, tree, cultivated land, man-made surface (roads, buildings etc), water body, exposed soil, rock. This will be a 5m DSM product created in ERDAS IMAGINE Photogrammetry using a proprietary workflow with no ground control points or field verification. Contours can also be generated at 5m intervals. 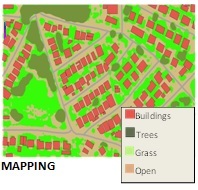 The imagery will be orthorectified to a greater accuracy level using the client provided Ground Control Points, depending on the quality of the reference data. 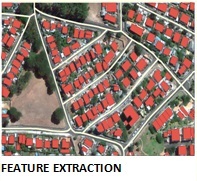 This product will be supplied as vector shapefiles to be incorporated into topographical maps and for GIS analysis.